Yesterday was a hectic day at office. Back to back meetings were lined up and I didn’t get much time to check my e-mails. Finally, in the afternoon, when I did, I found a few missed conversations. I went back to them and I was told that somebody had come to meet me in the morning with THE GIFT in hand. All that person knew was my full name and my address. They added that because I could not be reached, THE GIFT was handed over to the dispatch team. I was intrigued. Who was that mysterious man? Why did he carry THE GIFT for me? Why didn’t he know my contact number, but my full name? I was thrilled. I don’t remember when the last time when somebody has given me a surprise gift was. I thought really hard to guess who that mysterious man could be or what THE GIFT would be. Alas! But, I had more meetings to attend. I found it tough to follow the meeting. I had a difficult time in concentrating. I hope that my employer is not reading this! Thought about the mysterious man and THE GIFT continued to reign my thoughts. As soon as the meeting got over, I rushed to the dispatch. The moment I told them my name, I saw a sudden change in their demeanor. The lady handed over a sophisticatedly packed black box to me. It looked cute and charming. Can that be a perfume or a ring? Has somebody been stalking me? I could not hold on the apprehension anymore. I opened THE GIFT. 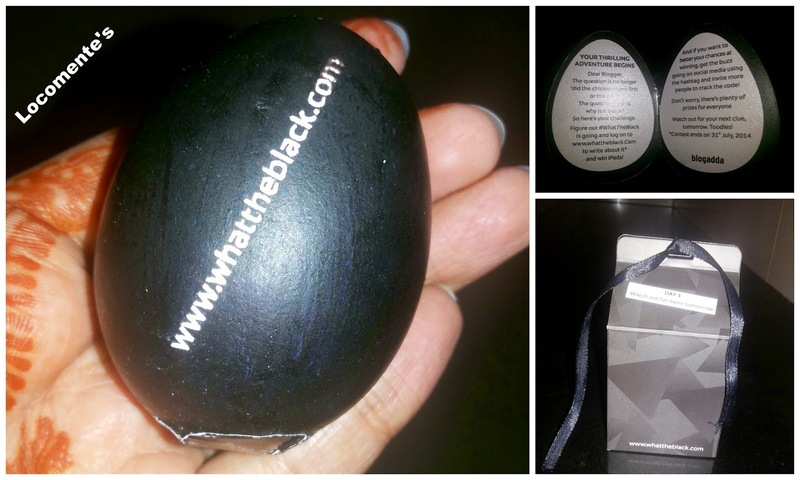 It was from Blogadda as a part of #whatTheBlack. It conveyed that the black box and the egg is the clue for Day1 and more will follow. A sticker on the black egg read that “store it in a cool and dry place”. I ripped open the sticker and saw a tiny hole. Wow! The egg was filled with somebody. Hang on! Does it smell like chocolate? I licked the black surface and found that my tongue turned black and the licked surface turned purple.